Paper.li: Be a publisher daily! Paper.li: Be a publisher… daily! Hervé Basset, independent consultant and author of the Science Intelligence blog, reviews Paper.li and considers how information professionals can use it. Paper.li is primarily an aggregation tool. It collates, into one place, the flow of information generated by your networks on Twitter and on Facebook or from RSS feeds. There have been many aggregation tools on the market - from the disruptive NetVibes some years ago to Seesmic more recently. But Paper.li presents the information in a simple and fun design. You can build your first ‘newspaper' extraordinarily quickly. The application uploads a huge flow of information from those you follow in a few seconds. The nice thing is that your customised newspaper is compiled using various multimedia content. Paper.li displays news, videos, slides or pages which are included in tweets from your network in an impressive, professional-looking design. Many web contributors have been already seduced by this wonderful tool. In June 2010, the young Paper.li (created in 2010 by a Swiss company SmallRivers) has reached the amazing milestone of 1 billion articles published by hundreds of thousands of micro-publishers worldwide (from Alaska to Zimbabwe they claim! ), 138 articles per second in 7 different languages! Design your daily news in a few seconds! You can build and design your daily in a few seconds. You can delete, feature or promote every article or document at the top of your daily. Your customised aggregation is updated automatically every 24-hours, with news from your contributors network. News is aggregated automatically by categories in different tabs (based on hashtags and metadata). You receive an email alert when a new issue is ready (and it is automatically archived to retrieve it later). It is then up to you to check, clean, publish and tweet your new issue to your followers. The design is very clean and you - and your readers - will be able to scan the page in a few seconds. The look is similar to an old-school newspaper, with just a few advertising spaces showing on the front page - the inevitable price to pay for a free service. You can publish up to 10 newspapers free of charge and decide on the frequency of your update. The default setting is daily, but you might wish to publish once a week - or twice a day. For your personal branding, an email alert can be sent out for each issue. Most paper.li journalists will tweet that their daily is out and will mention followers whose contribution they have selected in their daily e.g. "My Daily is out! Top stories via @hervebasset, @etc." indicates that the micro-journalist has kept published one of your tweets in his paper. In my opinion, Paper.li is more useful for curation than for flow management. Basically, curation is the art of selecting pieces of information from other authors and composing a news product. Most of time it is done by experts or specialists on a topic and published into a blog or specialised service such as Storify. Some years ago, some commentators suggested that blogging was the lower level of journalism - and curation might be thought of as at an even ‘lower' level. Commentary might be restricted and some curators might not check each item. The curator's input might be very limited, but for readers it is a very convenient way to get a regular news digest on their matter, without having to read the usual huge flow of tweets, articles, emails, etc. Paper.li is not fully customisable - page design in particular is not really flexible. The curation features are limited as well - you will just have an editor's note to give your opinion on the news that you publish. But this pure free service is a great communication tool which enables you to become a chief editor in a few minutes. Libraries can certainly use it to deliver appealing press reviews. 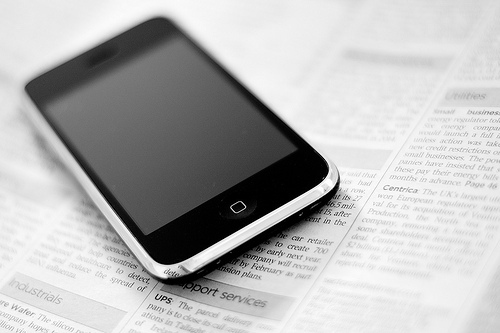 Picture of iPhone and newspaper by Andrew Stawarz via Flickr.